The City of Oakland is committed to leading Oakland’s progress in becoming a more sustainable city – a community in which all people have the opportunity to live safe, healthy and fulfilling lives, now and into the future. Protecting a clean and ecologically healthy environment; growing a strong economy brimming with opportunity; and fostering a safe, equitable and vibrant community are all critical components of this vision. Our award-winning sustainability efforts rely on a collaborative approach emphasizing balanced continuous improvement. Below are selected highlights of Oakland's sustainability achievements. Oakland’s approach to improving sustainability and growing the green economy has long emphasized partnerships with community, labor and business groups, both locally and regionally. Oakland is working with partners on several fronts to drive demand for energy retrofits and other green improvements, to attract and grow local green businesses and jobs, and to train local residents to secure and succeed in these new green jobs. These partnerships are helping to make Oakland a center of green economic development and innovation. Examples include the Oakland Partnership, Oakland Green Jobs Corps, East Bay Green Corridor, and East Bay Energy Watch. The resulting cooperative relationships across departments have helped the City align its climate and economic goals, support green workforce development, and secure resources to drive its sustainability agenda forward. The City of Oakland has teamed with local partners to recently launch the Oakland Shines program – an exciting energy reduction program that helps local businesses manage energy costs in Oakland's downtown business area. Oakland Shines is targeting all businesses in a 120-block area of downtown core, with a goal of achieving up to a 20% reduction in energy use from 80% of businesses in this downtown area over the next two years. The program offers free-start-to-finish technical assistance and cash rebates to eliminate or help defray the cost of installing energy efficient equipment from lighting changes to HVAC upgrades. This is one of the most ambitious neighborhood energy consumption reduction programs in the country. With the rising cost of energy, Oakland Shines offers Oakland's businesses a chance to reduce operating costs and to invest savings into growing their businesses, while attracting more business to Oakland. Visit the Oakland Shines website. Through the Energy Upgrade California program, it's now easier than ever for Oakland homeowners to improve the energy efficiency of their homes, saving money, increasing comfort and helping to protect the environment. Energy Upgrade California helps property owners to plan and carry out upgrades by providing technical guidance and links to qualified local contractors and financing assistance. Visit the Energy Upgrade California website. 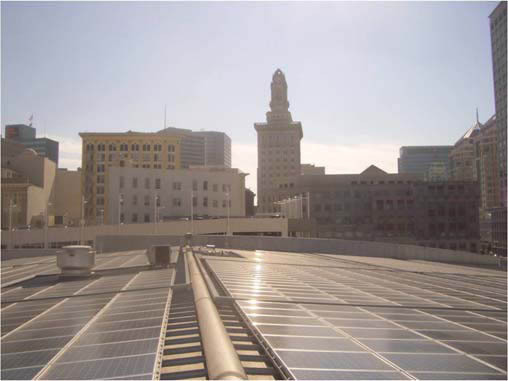 Oakland is taking a comprehensive approach to improving local energy performance. These efforts are reducing waste and pollution, keeping money in the local economy, and improving local infrastructure and encouraging new investment. Several energy efficiency programs are now operating in Oakland and separately targeting downtown commercial, small commercial, residential market-rate, residential renter-occupied, and multi-family affordable housing market segments. Oakland’s partnerships secured more than $61 million in ARRA funding for energy efficiency retrofits, and are projected to generate about 1,000 new jobs for Oakland and the region and about 2,000 jobs statewide. The City of Oakland is committed to fighting poverty and pollution at the same time, and believes it is imperative that we look at innovation to solve our environmental problems as opportunities to better the lives of all our citizens. Oakland is dedicated to leading the country on creating green jobs and transforming our community to create and capitalize on the new green economy. Oakland was one of the first cities in the nation to develop a Green Jobs Corps to create green pathways out of poverty and grow our local green workforce. Oakland’s Green Jobs Corps is comprehensive and elegant: recruiting green businesses to Oakland, creating green jobs, and training residents to be part of this new expanding green workforce. Partnerships have been key to creating green jobs and training a green workforce. 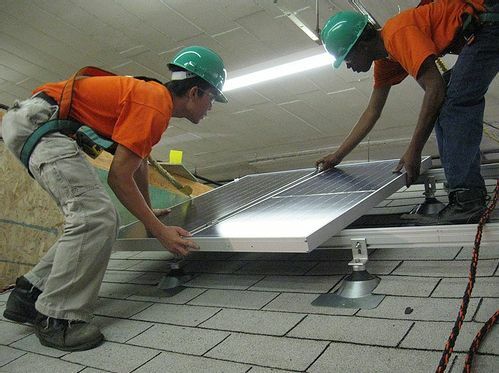 In 2008, the City launched the Oakland Green Jobs Corps by providing $250,000 to partners Laney College, Cypress Mandela Training Center and Growth Sector Inc. Together, this landmark partnership has secured additional funding and is providing world-class job training, environmental education, and connections to green jobs to low-income Oakland residents. The Green Jobs Corps is matching training programs with the expressed needs of local businesses and helping to identify entry-level green employment opportunities for program graduates. Graduates are trained to install solar panels on rooftops, weatherize homes to save energy and lower utility bills, and help construct new green buildings. Dozens of Oakland businesses have been certified as green businesses through the Alameda County Green Business Program. Multiple local green business associations are also active in Oakland, including the East Bay Green Chamber of Commerce, Sustainable Business Alliance, and East Bay Green Drinks. Oakland has become a regional hub of businesses specializing in energy efficiency and solar energy. View a brief video on Green Economic Development in Oakland. To learn more about greening your business, visit the City's Green Economic Development page. Oakland is in the process of finalizing its Energy and Climate Action Plan. We are finalizing our Energy and Climate Action Plan to reduce greenhouse gas emissions by 36% by 2020 – one of the most aggressive targets of any city in the country. This plan lays the foundation for many policy and programmatic actions that will accelerate the local clean energy economy. Dozens of local environmental, social justice, business, labor, and other community groups have participated actively in the development of the ECAP. 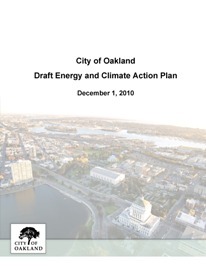 Learn more about the draft Oakland Energy and Climate Action Plan. The City has created an online Oakland Green Map to help community members find local green businesses. 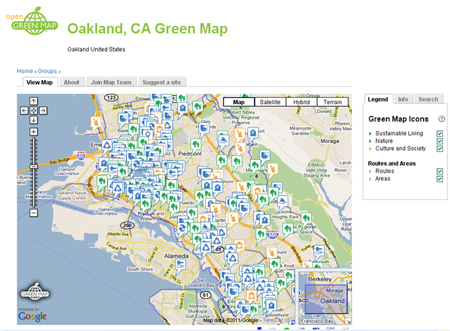 Visit the Oakland Green Map. 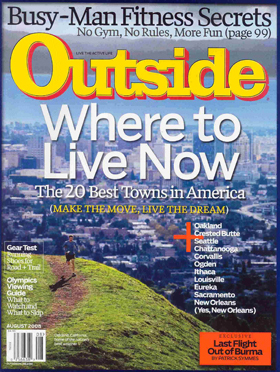 The City also annually publishes a Green Oakland insert in the San Francisco Business Times, highlighting local green businesses and buildings, and providing information to help existing Oakland businesses take advantage of green resources like new energy efficiency incentives. The Oakland Partnership Green Tech Cluster is a public-private partnership including the City, Chamber of Commerce, and many local partners, working to bring emerging green tech and clean tech industries to Oakland and the region. The Green Tech Cluster has identified and is working on a number of strategic initiatives with the objective of capturing more of the emerging green tech and clean technology industries in Oakland and the region. The East Bay Green Corridor is a collaborative initiative of eight cities, two world class research institutions and three cutting edge regional educational systems. The goal of the Green Corridor is to attract, grow and retain green business and jobs in the East Bay as a center of environmental innovation, emerging green business industry, green jobs, and renewable energy. Learn more by visiting the East Bay Green Corridor website. Oakland was one of three founding cities of the Bay Area Climate Collaborative (BACC), a dynamic and effective public-private partnership designed to advance local climate solutions. Regional partners of the BACC are collaborating on electric vehicle planning and implementation, green building and solar permitting, and other issues. Visit the Bay Area Climate Collaborative website. The City of Oakland is leading by example by continuously improving sustainability performance in internal City facilities and operations. Many improvements have been made to City facilities. The City has performed energy retrofits in 102 of its 115 largest facilities (representing over 60% of total building area), creating utility cost savings of over $1 million per year to the City's budget. The City has installed 1 Megawatt of solar electric panels on the rooftops of our Municipal Service Center and the downtown ice rink. These panels provide approximately 2.3% of our municipal electric load. The City has also adopted a Civic Green Building Ordinance requiring all new City facilities over $3 million in construction costs to meet LEED Silver green building standards. The City's Environmental Protection and Compliance Unit promotes environmental best practices in City operations, including plans for hazardous materials management, stormwater pollution prevention, water conservation, and other practices to ensure that the City’s internal facilities and operations comply with environmental regulations and achieve green business objectives. These efforts have recently earned the City green business certification for its Civic Center, Heavy Equipment Shop, and Municipal Services Center facilities. Recent policies have driven additional green operational improvements. The City's adopted Environmentally Preferable Purchasing Policy and Green Fleets Policy require all City agencies to strive to purchase the greenest options available when making procurement decisions. 14% of the City’s vehicle fleet now runs on alternative fuels like biodiesel and compressed natural gas. The City of Oakland has also adopted local hire and living wage requirements applying to all City projects and contractors working for the City. The City and its partners have taken a variety of other actions to make Oakland a more livable and sustainable community. Over the last 10 years, Oakland has added more than 16 miles of bike lanes and installed more than 700 bike racks in commercial districts. Oakland is now home to two LEED Platinum-rated buildings -- the first such city in the Bay Area to claim this honor. Oakland’s 10K Downtown Housing Initiative has resulted in the start and completion of 96 residential projects with 10,765 units, contributing to Oakland’s rapid downtown revitalization efforts that have attracted a burgeoning restaurant and nightlife scene and many new businesses. A new free downtown green shuttle was launched in 2010 to serve the downtown core and businesses are already anecdotally reporting increases in business (data surveys to be performed later in 2011). The number of neighborhood farmers' markets doubled in Oakland from 2005 to 2007. Oakland is also proceeding toward its adopted Zero Waste Goal and has exceeded State-imposed 50% waste reduction mandates by more than 10 percentage points. - 3,700 volunteers participated in the City’s annual Earth Day clean-up program, working over 11,000 collective hours to pick up 1,800 bags of trash and 20 tons of green waste.